Phil West is back. And for everyone who remembers how he electrified the dining scene when he and his wife, Cameron West, opened Range a decade ago, that’s a major announcement. He’s always had a way of subtly weaving together ingredients to create combinations that make diners pay attention. It shows in his light and airy chicken liver mousse ($14) and in the spike of coffee he rubs on the tender pork shoulder ($26), with the juices collected in the mat of ground hominy below. West has always maintained a hand in the kitchen, but a few years ago he stepped back a bit to spend more time with his family and to open Third Rail in Dogpatch. While the restaurant made the Top 100 last year, the food had lost a bit of the complexity that comes from the hands of a real master. It’s a quality that I’m not sure can be learned, much like a phenomenal singing voice. Inside Scoop announced a few weeks ago that chef Rachel Sillcocks was leaving after 2½ years to pursue her own dream, and that West was stepping back in. Even if I wasn’t aware of that change before my recent Update visit, I would have suspected it after just one bite of that chicken liver mousse. The intensely livery whip, served with warm toast, spreads like butter; the accompanying frisee, dressed with a vinaigrette, is designed to be put on top to cut the intensity. It adds just the right touch. That knowing hand extends to a confit garlic vinaigrette that’s judiciously applied to the Little Gem salad ($12), along with tiny fried capers, radish wedges and a blizzard of Parmesan that adds a nutty counterpoint. Goat-cheese stuffed pasta ($16), spiked with sorrel, is glazed in lime butter and chives, which offer an acidic quality that clears the palate for the creamy cheese filling. Steamed Manila clams ($14), another Range classic, were served in a creamy sauce with generous chunks of sausage deeply punctuated with fennel. Although the portion of clams was on the sparse side, the dish was topped with two slices of toasted garlic bread that created another play of contrasting flavors and textures. Olive-oil-poached true cod ($27) comes in a casserole with butter beans, lacinato kale and Meyer lemon Lucques olive tapenade. Lucques olives have a nuttier flavor than other varieties, so they blend and enhance rather than make a statement on their own. West rolls, ties, slow-cooks and sears a strip loin ($32), cutting a thick slice of the medium-rare beef to order. It’s so tender that the meat practically melts, forming a startling counterpoint to the crusty, salty exterior. He places the meat on fingerling potatoes, cipollini onions, rapini and a creamed horseradish for a play of classic ingredients realized in a new way. Desserts ($9) at Range have always been good, and that continues under Colin Kull. The chewy caramel nut tart on a shortbread crust is served with burnt honey cream and cashew butter; a tender genoise flavored with pistachio is set on toasted coriander meringue, with a pistachio cream that reinforces the elements of the cake, and a scoop of blood orange granita. Service has always been on point, but the staff seems to have stepped up, too. Our waiter was not only efficient but intuitive, knew the wine list and was able to move from table to table without losing her place. The dining room, which was a pioneer in the area, dovetails with the cuisine, featuring familiar items used in unexpected ways: a Depression-era medical cooler behind the concrete bar, industrial fan blowers that look like stylized ceiling lights in the main dining room, zinc-topped tables that contrast to the more refined glassware. It all comes together in an artistic, comfortable way. This summer Range will celebrate its 10th anniversary. 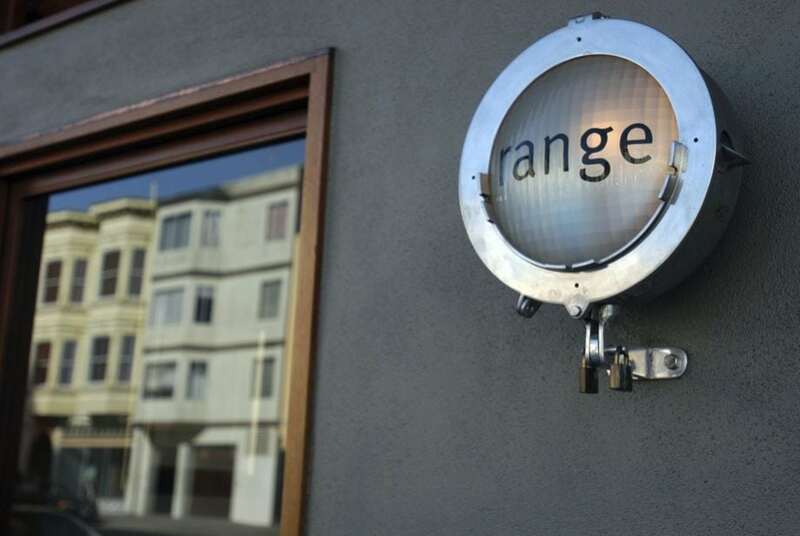 While the past decade has seen a lot of changes and expansion in San Francisco’s dining scene, Range, under West, has stood the test of time. It’s as fresh today as the day it opened. Dinner 6-10 p.m. Monday-Thursday, 5:30-11 p.m. Friday-Sunday. Full bar. 3% S.F. surcharges. Reservations and credit cards accepted. Difficult street parking.